Grow and enhance your business through unique and innovative DIRECTV® programming. CMS works with you to create the ideal package that suits your specific needs. Keep members entertained and informed while they work out. We can provide solutions for crystal clear television and music programming throughout your health and fitness club. Let us show you how to provide customized music solutions to enhance your customer’s experience. We design systems for all meeting rooms. 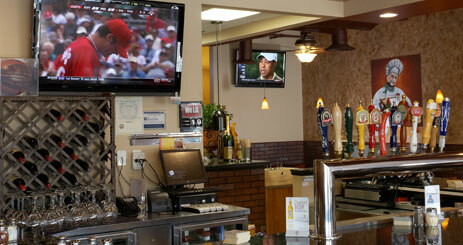 Keep customers entertained with audio visual systems that help reduce perceived wait time. Show impressive presentations with the latest technology for video presentations. DIRECTV® delivers around-the-clock access to breaking news and programs. Creative Media Solutions can design a system for your restaurant or bar that utilizes the latest High Definition (HD) technology and is easy for you and your staff to operate. CMS will also help you choose the DIRECTV and/or music package that is right for your restaurant, bar or entertainment center. Turn your establishment into the ultimate destination for sports or entertainment with DIRECTV’s exclusive packages and customized music. Customers will stay longer and purchase more when they can enjoy the atmosphere. They'll also invite their friends and come back as a group. Contact us today to create a lasting impression for your customers.